Po must face two hugely epic, but different threats: one supernatural and the other a little closer to his home. As I’ve noted in other reviews, studios used to view January as the month to dump bad movies onto the marketplace and be done with them. However, a few notable successes showed that audiences will flock to theaters any time of year if they find something they like. That said, I find it hard to embrace this new paradigm, so I still think “probable dud” when I see a January release date. Because of this, I felt shocked when I saw a January 29, 2016 release date attached to Kung Fu Panda 3. Both the original 2008 film and its 2011 sequel came out smack in “summer blockbuster season”, so it seemed illogical that Panda 3 would emerge in a relatively “dead” time of year. Did this decision backfire? Maybe. Panda 3 made a competent $143 million in the US, which showed a moderate drop compared to the second film’s $165 million. Still, with a worldwide gross of $518 million, I expect Panda 3 made money, though whether it did well enough to spawn Panda 4 remains to be seen. While I thought the first film seemed pretty average, I rather liked Panda 2, so I went into Panda 3 with moderate expectations. A prologue takes us to the Spirit Realm, where a baddie named Kai (voiced by JK Simmons) steals the “chi” of various kung fu masters – including Grandmaster Oogway (Randall Duk Kim). This allows Kai to return to the mortal realm, where he plans to capture “Dragon Warrior” Po’s (Jack Black) chi and conquer all he encounters. Given warning by Oogway, Po gathers his compatriots and trains to battle Kai and his goons. In the meantime, Po receives a shock: he meets his biological father Li Shan (Bryan Cranston). 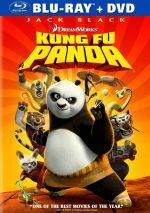 Along with his pals – and jealous adoptive father Mr. Ping (James Hong) - Po reunites with his fellow pandas and prepares to face the threat posed by Kai. As I mentioned earlier, the first Panda seemed average to me, but I thought Panda 2 offered a clear step up in quality. It seemed looser and funnier than the first, so it left me in a good mood for Panda 3. In terms of quality, Panda 3 probably hews closer to the first film than to the second. While Panda 3 offers reasonable entertainment, I don’t think it turns into a consistently involving effort. Ironically, one problem reverses a complaint I had about the original movie: story complexity. Whereas the first film suffered from an excessively simple plot, Panda 3 feels bloated in that regard. This means a surfeit of narrative lines. We need to work through Kai’s threat as well as Po’s relationships with his natural and adoptive fathers as well as Po’s push toward a leadership role as well as elements related to the panda villagers. That seems like an awful lot for one 95-minute movie, and Panda 3 can’t quite keep up with all those threads. While the movie doesn’t seem hyperactive, it does come across as less focused than I’d like, as all those story areas can’t quite unite to make one coherent movie. Still, that doesn’t make Panda 3 bad, and it musters a consistently likable experience, even if not one that becomes memorable. At least the surfeit of plot points means we don’t find ourselves stuck in one place for long. Don’t like a story area? Give the movie a few minutes and it’ll go somewhere else. Of course, that results in the opposite effect as well: if we like a particular story spot, we probably won’t see it explored in depth. This seems particularly true for the panda villagers, as they get minor exposition but nothing more. Other than a short but fun Seven Samurai-style training sequence, the movie fails to use them well. I suspect Panda 3 would’ve worked better without the family narrative. Granted, Panda 2 pushed it in that direction, as a teaser at the earlier film’s end revealed that Po’s dad remained alive, so it would’ve been weird to move Panda 3 along without that theme. Still, I think a Panda tale that concentrated on pure action/adventure without pretensions of extreme exposition would be fun. They could still teach lessons but just leave out the massive character arcs found here, as Po confronts many personal areas that we don’t really need. The returning actors continue to do fine in their roles, and Simmons creates a credible villain. He lacks the glib panache of Gary Oldman in Panda 2, but he acquits himself well enough. All of this results in a perfectly watchable but somewhat overstuffed adventure. Panda 3 gives us a pleasant enough 95 minutes – it just doesn’t zing. Kung Fu Panda 3 appears in an aspect ratio of approximately 2.35:1 on this Blu-Ray Disc. This became a killer presentation. Sharpness was always excellent. Virtually no instances of softness appeared, as the flick demonstrated nice clarity and delineation. No issues with jagged edges or shimmering occurred, and edge enhancement remained absent. Source flaws also failed to mar this clean, fresh image. Panda 3 boasted a fairly teal and orange palette. Still, the movie featured a decent variety of other hues, and the disc made them look quite good. The tones seemed lively and full throughout the movie. Blacks were dark and tight, while shadows looked clear and well-delineated. This was a flawless presentation. As for the DTS-HD MA 7.1 soundtrack, it also worked well. Most of the material stayed in the ambient realm, as the elements often just supported the settings in a general way. That said, action scenes managed to add activity from the sides and surrounds, and the entire track offered a good sense of place. The action sequences used all the channels in a satisfying manner and created a broad, involving sense of the material. Audio quality was solid. Music sounded dynamic and full, and effects followed suit, as those elements appeared tight and accurate. Speech came across as natural and concise, without edginess or other concerns. All in all, this was a very nice soundtrack. While the Blu-rays for the first two films packed lots of good extras, Panda 3 seems less satisfying in that regard. Everybody Loves a Panda Party gives us a music video that combines a rewritten “Kung Fu Fighting” with some unique animation. It can also be viewed in Karaoke mode. It’s cute but forgettable. Within Po’s Posters of Awesomeness, we get a three-minute, 30-second reel. It offers narration from Po and a view of ads Mr. Ping uses for his restaurant. Like “Panda Party”, it brings some minor amusement. For Panda Paws, we find a two-minute, 23-second reel. Mei Mei stars in this short, as she shows her dance skills at a competition. It brings us another small bit of fun. An activity, Make a Panda Party Paper Pal comes next. The three-minute, 38-second teaches viewers how to fold paper to make a panda. It requires an insert found in the Blu-ray package – and offers a lackluster instructional. Real animals come to the fore in the four-minute, 44-second Play Like a Panda. It includes comments from directors Jennifer Yuh Nelson and Alessandro Carloni, as they discuss panda facts. This gives us a few insights, but it’s a largely insubstantial piece – and redundant if you’ve seen similar programs on prior discs. Another featurette, The Origin of “Skadoosh” goes for two minutes, 21 seconds. “Po” explains the formation of his signature term. Yup – it’s another cute but forgettable clip. Three Deleted Scenes run a total of seven minutes, 50 seconds. The first adds more action, while the other two enhance character relationships. All seem interesting, though none needed to be in the final film. Nelson and Carloni give us introductions that offer some thoughts about the sequences – and why they got cut. They add good background for the segments. Finally, a Gallery appears. It gives us 29 images from the film. I would’ve preferred concept art. The disc opens with ads for Ice Age: Collision Course and Voltron: Legendary Defender. Sneak Peek adds promos for Home, The Peanuts Movie, Dinotrux, Penguins of Madagascar, Mr. Peabody and Sherman, DreamWorks Animation Original Series and Alvin and the Chipmunks: The Road Chip. We also find the trailer for Panda 3. Under The World of DreamWorks Animation, we find various promotional elements related to Shrek, Madagascar, How to Train Your Dragon, Kung Fu Panda, The Croods, Turbo and Home. Mostly we get music videos, but a few trailers appear as well. A second disc presents a DVD copy of Panda 3. It includes most of the Blu-ray’s extras, with the deleted scenes being the most notable omission. Although Kung Fu Panda 3 delivers reasonable entertainment, it never coalesces into anything great. This makes it an enjoyable flick but not one that excels – and it becomes a mild step down after the superior Panda 2. The Blu-ray presents excellent audio as well as pretty good audio and a spotty roster of supplements. Panda 3 reinvents no wheels and turns into a moderately amusing affair.